Ready for an unforgettable Pigeon Forge vacation? Our cabins in Pigeon Forge, TN are perfect for exploring the nearly endless attractions, shops, and restaurants on the parkway. Dollywood, the Titanic Museum, Tanger Outlet shopping, – there are more than a few reasons to take your own Pigeon Forge vacation. Many visitors do choose to stay in cabins in Gatlinburg, TN, but Pigeon Forge rentals are another excellent option. What makes the perfect Smoky Mountain getaway? We find that guests want a cabin that offers scenic views and quick access to local attractions. While many of our cabins are tucked away in secluded mountain settings, they are only minutes away from the Pigeon Forge Parkway! With these rentals, you can ensure you spend your vacation time enjoying the sights and sounds of the Smoky Mountains and not wasting it with long drives and traffic. Start exploring Cabins USA Gatlinburg's premier selection of cabin rentals in Pigeon Forge, TN to find your perfect location, date, and luxury amenities. Our new search feature makes it easier than ever. An important part of choosing a vacation rental is deciding how many bedrooms you will need. An affordable choice is our 1 bedroom cabins in Pigeon Forge. These cozy log cabins in the Smoky Mountains are perfect for couples and smaller groups looking for affordable rental cabins in Pigeon Forge, TN. For family-sized groups and groups of friends visiting the Smoky Mountains, 2 bedroom cabins in Pigeon Forge, TN and 3 bedroom cabins offer spacious lodging. There are also large group cabin rentals in Pigeon Forge that include 8 bedroom cabins. A favorite feature included in our cabin rentals in Pigeon Forge, TN and the Smoky Mountains are hot tubs and Jacuzzis. Our cabins in the Smokies with hot tubs allow visitors to unwind at the end of the day, These hot tubs are located on the back decks of cabins and treat guests to breathtaking mountain views. Feel the stress melt away with the soothing waters of your Smoky Mountain hot tub. With so much to do and see in the Smoky Mountains and Pigeon Forge, it is hardly surprising that large groups choose the Smokies as the location for events and celebrations. With popular conferences, conventions, and gatherings, such as the Pigeon Forge Rod Run, many groups need large accommodations to fit their group comfortably. Make your stay easy and stress free by staying close to events and attractions your group wants to see! Cabins USA Gatlinburg offers large group cabins in Pigeon Forge, TN just for such occasions. Browse our large and luxurious cabins ideally situated for attending gatherings at local Pigeon Forge convention centers or simply enjoying fantastic Pigeon Forge amusements. Thinking of planning a wedding in the Smoky Mountains? Newlyweds can book large cabins for wedding celebrations and honeymoon rentals for the bride and groom! Feel free to contact our reservation office to help reserve several cabins. Cabins USA Gatlinburg's Pigeon Forge, TN cabins come with a 15% discount when you book online! Don't miss out on this opportunity for great vacation savings in the Smokies. Enjoy luxurious amenities, prime locations, and rustic log cabin appeal when you book a Pigeon Forge, Tennessee rental cabin for your Smoky Mountain vacation! Find romance at your Upper Middle Creek Pigeon Forge honeymoon cabin, "Bear Tracks." This 1-bedroom cabin comes with 2 fireplaces, hot tub and a nice view. Book "Enchanted Evenings," a premium honeymoon cabin with a hot tub in the Smoky Mountains nestled in the Pine Mountain Rd. area close to Pigeon Forge, TN. "Our Happy Place" is a 1-bedroom cabin with a prime location in the Smoky Mountains. Bring someone special on a romantic trip they won't forget and save! This unique honeymoon cabin with a treehouse design boasts a great location in the Smoky Mountains, a hot tub, resort swimming pool access in the Smokies! "Romantic Evenings" is a beautiful log cabin in the Smoky Mountains for couples celebrating honeymoons, anniversary trips, or weekend escapes! Searching for Arrowhead cabin rentals in Pigeon Forge TN for your honeymoon or next romantic getaway? Enjoy a "A Romantic Journey" at this 1 bedroom cabin for your vacation. "Angles Ridge" is a 1 bedroom cabin near Pigeon Forge that's ideal for honeymoons. This cabin sleeps 2 guests and comes with pool access, a hot tub, and more! Book your 1 bedroom honeymoon cabin with a 15% discount and enjoy a secluded Smoky Mountain cabin experience with great views close to Pigeon Forge! Private honeymoon cabin in the Smokies close to Pigeon Forge. Enjoy your 1 bedroom cabin with great views and a 15% discount! 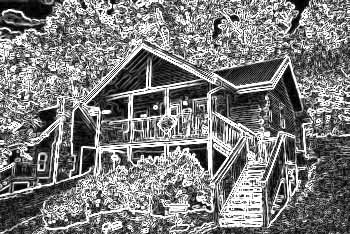 Enjoy "Moose Tracks," a romantic 1 bedroom cabin in the Smoky Mountains close to the Pigeon Forge Parkway. Enjoy great views and our special cabin discount! "Royal Romance" is a honeymoon cabin near Gatlinburg with swimming pool access, jacuzzi, fireplace, hot tub and very romantic king bed. Online Special! Enjoy this cabin near the Gatlinburg Golf Course that offers access to an outdoor and indoor swimming pool! This great cabin features comfortable amenities and resort features for a memorable mountain vacation. Experience a honeymoon log cabin in the Smoky Mountains in Arrowhead Resort with a heart-shaped jacuzzi, pool access, hot tub, and more with "A Lover's Retreat!" Need a romantic, affordable cabin that's close to Pigeon Forge and Gatlinburg? Look no further than "Gray's Place" a cozy cabin that's right off the Parkway! Escape to the Smoky Mountains in the beautiful Arrowhead Resort area of Pigeon Forge. Enjoy resort pool access and a romantic cabin with a discount! Enjoy a romantic "Lazy Retreat" with this romantic cabin with mountain views close to downtown Pigeon Forge that's perfect for couples! Book this romantic 1 bedroom condo in Pigeon Forge with an indoor & outdoor swimming pool with Cabins USA Gatlinburg to save 15% on your nightly rate! Book this affordable honeymoon condo with an indoor and outdoor resort pool with Cabins USA Gatlinburg and save 15% on your nightly rate! Come escape to the Smoky Mountains at Blackberry Resort, near Gatlinburg TN! Cabin rentals such as “Absolute Delight” and many others in Pigeon Forge. Book online for immediate savings! Book this lovely 2-bedroom cabin rental near Gatlinburg in Arrowhead Resort and enjoy swimming pool access as well as a private theater Room with an 80-inch Smart TV! Enjoy your vacation in Gatlinburg at “Rushing Waters” a 2-bedroom cabin with a river view in nearby Pigeon Forge that places minutes away from restaurants and entertainment. Welcome to your cabin in Pin Oak Resort near Gatlinburg with swimming pool access and simply irresistible Smoky Mountain views! Book online for our Cabin Special! Want a cabin with a beautiful view of the Smokies? "Splash Mountain Lodge" boasts a great location and a private indoor swimming pool for guests! Experience your next Smoky Mountain getaway with this affordable 2 bedroom resort cabin in Pigeon Forge with a hot tub, swimming pool, and more! Welcome to "All Tucked Inn", your 2-bedroom cabin with pool access near Gatlinburg in Blackberry Ridge Resort that offers a comfortable mountain getaway near top attractions. Head to your home away from home at "Amazing Grace II," a cozy 2-bedroom vacation rental near Gatlinburg that offers a comfortable interior and a convenient location. Enjoy "American Pie," a log cabin close to the Parkway in Pigeon Forge with a hot tub and mountain views. Book today & save with our discount! Enjoy "American Pie 2," a log cabin close to Gatlinburg and the Pigeon Forge Parkway. This 2 bedroom cabin sleeps 6 guests and can be booked with our discount! "Bear Paw Chalet" is a 2 bedroom vacation rental in Pigeon Forge that comes complete with a hot tub, deck, and a river view in the Smoky Mountains! Book this 2-bedroom Smoky Mountains cabin and earn a 15% discount on your stay! Enjoy a cabin with a pool, hot tub, game room, and mountain views! Check out our Golf View Resort cabin near Dollywood in Pigeon Forge. Dainty's Digs is less than a mile off the action packed Pigeon Forge Parkway. Honeymoon Gardens Pigeon Forge cabin near Dollywood with air hockey, hot tub and fireplace sleeping up to 7 guests. Check out "Lookin Up," a comfortable log cabin in Blackberry Ridge Resort with pool access located between Pigeon Forge and Wears Valley, TN. Book "Pigeon Forge Hideaway" a lovely 2-bedroom, kid-friendly cabin close to Dollywood and Pigeon Forge. Save with this cabin rental's special online discount! "Rippling Waters" is a beautiful 2-bedroom vacation rental located near a river in the Great Smoky Mountains! Book today and save 15% on your nightly rate! Escape to the mountains at "A Twilight Hideaway" and enjoy a private 2-bedroom cabin rental near Gatlinburg that features 3 decks, satellite TV, a jacuzzi, and more! A delectable cabin in the Smoky Mountains called Above The Clouds where guest enjoy scenic mountain views and more! Book online for immediate savings. Enjoy Cinnamon Cottage near Gatlinburg, Tennessee, vacation accommodations with a hot tub less than a mile from the action-packed Parkway. "Dancing Bears" is an affordable 2 bedroom vacation rental located less than 1 mile from the Pigeon Forge Parkway in Pigeon Forge, TN! Relax at your comfortable 2-bedroom vacation home near Gatlinburg that offers a convenient location off the Pigeon Forge Parkway. Every member of the family will love a stay at "Hillbilly Deluxe," a charming pet-friendly 2-bedroom cabin near Gatlinburg. Cabins USA Gatlinburg is proud to offer "Honey Bear Hill," a Honeymoon Gardens Resort cabin. This romantic honeymoon cabin is affordable & great for couples! Relax at your 2-bedroom vacation home with fireplace, jacuzzi, deck, and more, "Mountain Music"! Stay and play at Creekwalk cottage in Pigeon Forge! The Bunkhouse cottage is a mile off the action packed Pigeon Forge Parkway with swimming pool access. Get ready for an excellent Smokies vacation when you book this 2 bedroom condo with indoor & outdoor pool access in the Great Smoky Mountains of Tennessee! Experience this beautiful condo close to Downtown Pigeon Forge in the Smoky Mountains with a mountain view, jacuzzi tub, and a 15% discount from Cabins USA Gatlinburg! Book this 2 bedroom condo in Pigeon Forge with Indoor & Outdoor Pool Access to save 15% on your nightly rate in the Great Smoky Mountains of Tennessee! "A River Retreat" is a beautiful cabin rental in Pigeon Forge with a private outdoor pool, a hot tub, a fire pit, and a nice river view! "Above The Rest" is a gorgeous 3 bedroom chalet close to Gatlinburg with great views and a game room with a pool table, air hockey, and darts. Book & save 15% on your lodging! "Dew Drop Inn" is a lovely log cabin rental near Dollywood and Downtown Pigeon Forge. Book your cabin in the Smokies with a game room and save 15% with us! "Lucky Logs Lodge" is a 3 bedroom cabin close to Dollywood and the Pigeon Forge Parkway. Enjoy a game room and outdoor hot tub during your stay in the Smokies! Escape to the mountains for a fun and exciting vacation at "Up to Nut'n," your 3-bedroom cabin near Gatlinburg with pool access, game room and more. Enjoy this Smoky Mountain cottage rental located a half-mile off the action-packed Pigeon Forge Parkway with 3-bedrooms and hot tub. Wears Valley cabin rental with mountain view, secluded Wears Valley cabin with game room, air hockey and fireplace. Book today and save with Cabins USA Gatlinburg! Book this 3 bedroom condo that's right off the Parkway with Cabins USA Gatlinburg to save 15% on your nightly rate in the Smoky Mountains! Your gorgeous resort cabin near Gatlinburg,” Bear-E-Nice,” accommodates up to 10 guest in a comfortable lodging just off the action packed parkway in Brookstone Village Pigeon Forge TN. Looking for a spacious Smoky Mountain cabin with pool access and room for 12 guests? Come experience "A Fieldstone Lodge" in Pigeon Forge, TN! "River Chase" is a beautiful 4 bedroom vacation rental on the river in Pigeon Forge complete with a jacuzzi, game room, and our 15% discount! With 4 bedrooms and room for up to 13 guests, "Sweet Mountain" is an excellent Smoky Mountain cabin that's only 1 mile from Downtown Pigeon Forge, TN! Come experience "Mountain Crest," an affordable 4 bedroom cabin in the Smoky Mountains with a resort swimming pool, hot tub, and a great location! Need a log cabin with pool access and room for 11 guests in the Smoky Mountains? Look no further than "Mountain Destiny." Book this cabin today & save 15%! "Mountain Fever" is a beautiful 4 bedroom cabin in the Smoky Mountains that has pool access, a hot tub, pool table, and our special cabin discount! Check out our Arrowhead Resort Pigeon Forge Tennessee cabin, All Together Now. A 5 bedroom Pigeon Forge cabin with swimming pool access sleeping 16. Bring your family and friends to a secluded Smoky Mountain cabin with a view they won't forget! Enjoy a theater room, game room, and our special discount! Want a luxurious cabin in the Smokies with a mountain view and a private indoor swimming pool? Book "Elk Ridge Lodge" with Cabins USA Gatlinburg today! "Endless Sunsets" is a beautiful cabin in Pigeon Forge that sleeps 22 guests with 5 bedrooms. Enjoy a mountain view, hot tub, indoor pool, and a 15% discount! "TrinQuility View" is a luxury Smoky Mountain cabin that comes complete with a private indoor pool and outdoor resort pool access in Sherwood Forest Resort! You and your family will have a fun "Mountain Time" at this 5-bedroom cabin near Gatlinburg with game room, hot tub, and more! Reserve your own group cabin that sleeps 20 guests in Alpine Mountain Village Resort in the Smoky Mountains. Book online today to save 15% on your trip! Take off to the Smokies for a vacation you won't soon forget at "Arrowhead View Lodge," a luxury 6-bedroom cabin with game room, deck, and more near Gatlinburg. C'mon Inn is a luxurious Alpine Mountain Resort cabin in the heart of the Smokies for 25 guests. This premium cabin comes with a 15% online discount! "Smoky Mountain Memories" is a beautiful, luxury 12 bedroom cabin in Pigeon Forge that boasts both an indoor and outdoor swimming pool in the Smoky Mountains!